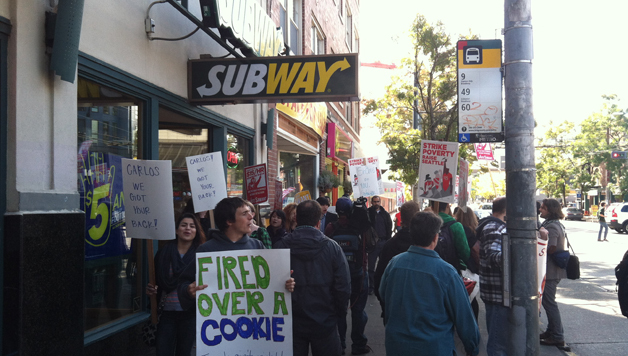 Kshama Sawant, Seattle’s independent working class City Council candidate, will be attending a press conference to support the filing of federal charges against Subway for firing Carlos Hernandez for his role in recent fast food workers’ strikes for $15/hour and a union. The press conference is being called by Good Jobs Seattle. Councilmembers Richard Conlin and Nick Licata will be attending. “I support pursuing every possible legal avenue to win Carlos’s job back. However the courts and the government have totally failed to defend workers’ rights, with over 10,000 workers illegally fired each year for union activity. In addition to legal means, workers need to continue building an even stronger campaign of protests and workplace actions,” Sawant stated. Carlos Hernandez has endorsed Kshama Sawant for Seattle City Council position 2, joining a growing list of prominent working class and progressive activists (see www.capitolhillseattle.com/2013/09/broadway-subway-worker-who-participated-in-fast-food-strike-wants-job-back/ and www.votesawant.org/endorsements). Unlike our opponent and other incumbents on the Council, we are not financed by big business and the richest 1%. Our political work is carried out by dedicated volunteers, and relies on the financial support of ordinary workers, young people, and activists. Contributions of any size are invaluable.